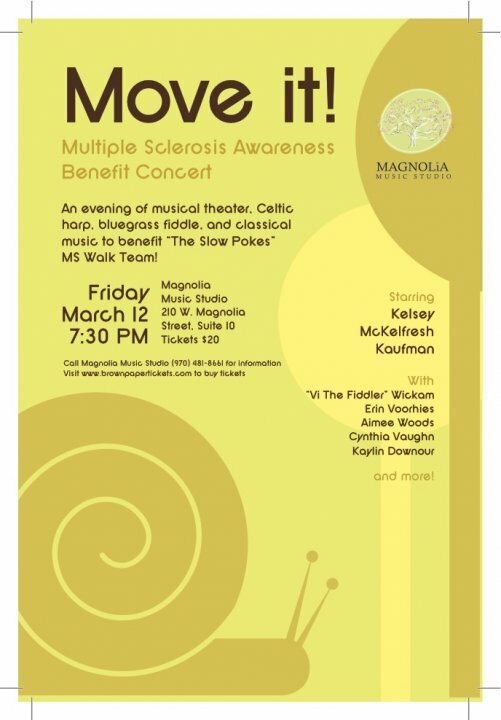 FORT COLLINS, CO— To help celebrate National Multiple Sclerosis Awareness week, Magnolia Music Studio is hosting a benefit concert to raise funds for the Colorado Chapter of the National MS Society. 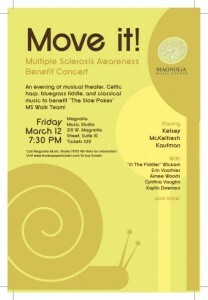 “Move It!” MS Awareness Benefit Concert will feature a variety of Northern Colorado performers with all proceeds going to THE SLOW POKES, a local MS Walk Team. THE SLOW POKES Walk team is led by Sharyn Smith, who will be participating in the Denver Walk MS event on Saturday, May 1, 2010. Native Coloradoan Kelsey McKelfresh Kafman, recently returned from NYC, will be the featured performer for the event. Kelsey will be joined by “Vi The Fiddler” Wickam, guitarist Richard Kelley, Celtic harpist Joy Hopley, vocalists Aimee Woods, Erin Voorhies, Cynthia Vaughn, Kaylin Downour, pianists Amy Chase and Donna Lewis and more for an evening of musical theater, Celtic harp, bluegrass fiddle, and classical music. Tickets for this event are on sale now through www.brownpapertickets.com. Study with experienced professionals in an elegant Old Town studio! Voice, harp, fiddle and flute lessons plus classes, concerts, yoga, and events. Founder/Director Cynthia Vaughn is co-author of The Singing Book, song anthology/ CD/textbook which is used at hundreds of universities. All Magnolia faculty have music degrees and/or professional experience/certification. Classes include – THE SINGING CLASS for teens/adults, SONGS&SKITS, a singing class with drama for 7-11 year olds, and INTRODUCTION TO YOGA, INSTRUMENTAL WORKSHOPS, VOCAL PERFORMANCE CLASS. Classes and lessons offered in ongoing six-week sessions. Visit the Magnolia Music web site for the current schedule, information and tuition. Native Coloradoan Kelsey McKelfresh Kaufman recently returned to her home state from NYC. She graduated from the prestigious Cincinnati Conservatory with a BFA in Music Theater. She has performed as a soloist with the Cincinnati Pops Orchestra and “A Night on Broadway” in Munich, Germany. Honors include Best Actress in a Musical (Ohio Regional Theater Awards) for her role as Svetlana in CHESS. In NY, Kelsey appeared on television, radio, and the Disney Magic Music Video series, and modeled for Ford Chicago and CLICK NY. She is a specialist in stage dialects. Kelsey began her stage career with northern Colorado’s Open Stage Theater and Carousel Dinner Theater. She is a proud alumnus of Rocky Mountain High School in Fort Collins.